Board games that aren’t boring. I love board games! Most of our favorite board games are fun to play, take around an hour to complete and are easy to learn. Most of the games we play are broadly categorized as “german-style” or eurogames, which are generally designed for families or casual groups, and the focus of these games is usually to outperform your opponents, rather than directly interfere with them. I enjoy games which contain a balance of tactics (making the best move right now) and strategy (making a move which doesn’t help me as much now, but helps me even more in the long run). I tend to lose interest when a game is too biased towards Tactics, and I get frustrated when a game is too heavy on Strategy, as it can cause players to take really long terms as they consider all of their options and their long-term ramifications. One of the best resources to learn about board games is the Board Game Geek website. (boardgamegeek.com) Once you find one game which you like, it easy to find others you might enjoy by reading their detailed reviews and ratings. You may also be able to find stores in your area that specialize in this style of games. Their staff is generally very good at helping customers select a game they might like, and some stores have an open copy of the most popular games, so you can try before you buy. 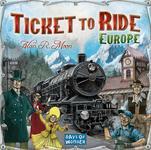 Ticket to Ride is very easy to explain, but difficult to master. The game is played on a map with cities connected by possible rail routes. You start the game with tickets, each containing two cities which you are trying to connect. You connect the cities by laying town track between cities. You pay for the track by collecting resource cards of the corresponding color. The game ends when the first player runs out of track, and the player witht he most points from track and completed tickets wins. Carcassone is a fast paced game where each player in turn adds a tile to the countryside, laying claim to fields, roads and cities as they go. As these features get completed, players earn points, and the highest score wins. 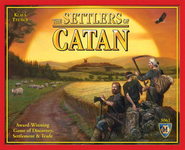 Settlers of Catan started the eurogaming revolution here in the US. It is a fairly complex game to teach, but once you get the hang of it, it can be a lot of fun. You begin with two settlements which are surrounded by the resources grain, brick, wood, sheep and ore. Each resource has a die roll associated with it, and you get resources when the corresponding numbers are rolled. You use resources to compete for roads, additional settlements, cities and more. The player who earns 10 points first wins. Race for the Galaxy is actually a card game, abeit a complicated one. In this game, you are competing to control the galaxy by establishing settlements and developing enhancements to your operations. There are many different ways to succeed at the overall goal whihc is to have the most points, and in most games you employ more than one strategy. A complicated set of rules and symbols make this game particularly difficult to learn, but the great variety of strategies has kept us coming back after more than 60 games. These are just a taste of the interesting games that are out there. If you are interested, you can see all the games I own and most of the games I have played by finding my page or my collection of games on the BoardGameGeek website. I love board games! And I love playing them with you! I think Race is my favorite, but Carcassone and Settlers are a close second. Your tuckboxes are awesome! I’m relatively new (and already addicted) to Carcassonne. Your boxes have saved an enormous amount of space on my game shelf. Thanks for the update for Wheel of Fortune. Not only does it get one more box off of my shelf, but helped me figure out how to incorporate WoF as an expansion with the others.